Honda refreshes the 125 cc CBF Stunner..
After 2 rather conservative designs/products in the form of the 150 cc Unicorn and the 125 cc Shine, the 125 cc CBF Stunner was the first sporty design to have come out of Honda Motorcycles and Scooters India (HMSI). Back in 2008 when the CBF Stunner was launched, I thought that the bike seriously had the potential to become a best seller for Honda. After all the bike had the "premium" good looks of a "mini Karizma", at a price point lower than the reigning 150 cc bikes along with the fuel efficiency and reasonable performance of a 125 cc engine. But somehow that never happened and the conservative CB Shine still continues to be Honda's best selling 125 cc in India. Indian customers are really a tough nut to crack. Probably the Indian customer could see through the half fairing that it was just a 125 cc bike, with a slightly higher price tag compared to the competition. Honda gave the CBF Stunner it's first upgrade back in Jan 2010. But still there wasn't any major change to the CBF Stunner's fortunes. Honda has again decided to give the CBF Stunner a minor upgrade. But this time it is just a paint/sticker job. So what has changed in the CBF Stunner? The CBF Stunner branding has been moved from the side panels to the fairing. There is also a slight change in the sticker/color pattern on the new CBF Stunner, but then you really have to look very closely to notice the change. The more significant move has been the addition of a new "Candy Palm Green" color which looks striking. The engine specs remain untouched and so is the pricing.The top end variant of the CBF Stunner in "Self Start-Disc-Alloy" comes for the price of Rs. 54,509 (Ex-Showroom, Delhi). I did a test ride, Stunner is really an awesome bike, in terms of fuel economy, looks, price i think no bike can beat stunner. Over all HONDA CBF STUNNER is an excellent bike. please anyone told me the onroad price on honda cbf stunner which will be launched in 2012 in kolkata? I own a Stunner (carb), around 6months old in Bangalore. The bike's price on-road bangalore is around 66.1k but u will put on some accessories since the bike does not come with any. so 68k totally it will cost u on-road. - Superb looks with half fairing. 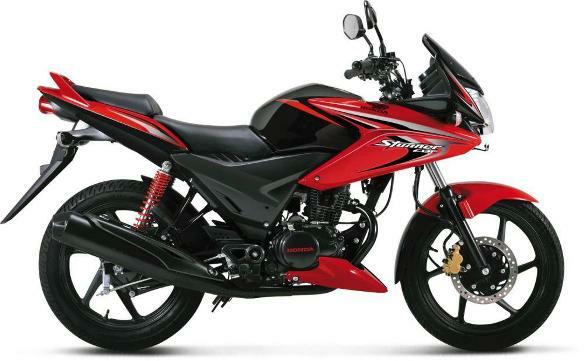 - One of the best handling in <=150cc bikes in India. - Comfortable suspension and riding position slightly sporty but upright.. Seats are comfortable. - Good linear power delivery for a 2-valve engine. - City mileage of around 41 kmpl for a 125 cc engine is too bad. Earlier I used to drive a 11yrs old Bajaj Caliber and believe me it returned me 56kmpl on the same route in city. Sold it. - After 65kmph the engine vibrates and feels too stressed. - Small engine 125cc does not do justice to the looks of the bike. - Model a failure and spare parts seem to be a problem. My bike has a error in fuel gauge as well and Honda service is not customer friendly by any means. (The most is Bajaj IMHO). If you are on a cash crunch and 41kmpl is good for you and you can risk going with a bike which has very bad sales and can be stopped and want only looks but not power go for Stunner. Very comfortable bike indeed. If not, one of my friend in Kolkata bought P135LS. I dont like its looks but its a 4valve engine and power comparable to most 150cc bikes. He's getting Mileage of almost 50kmpl too. Best selling bike in that segment. I suggest you to go for P135. Other than that Shine is an ok types bike if you want smooth engine and good mileage but bad design and 4gears. Am the owner of honda stunner since 2 yrs ,milage 40kmpl at 50kmph speed. If u want to ride this bike beyond 60kmph without vibration means it,s never and ever possible.chain spocket life is 30,000 km ,oil should be changed at 2000 km .if u want to change any parts you need to start searching for spare parts before two months otherwise you will not get a spares.rear side fibre panels are very deligate.rear seat is in very height position so pillion rider will find difficult to climb. hiiiiiiiiii frnz .the new stunner is so so so ROCK ...IT'S LOOK , MILAGE(AROUND 60 IN CITY AND 65 IN HIGWAY),,ANH PICKUP,COMFORTNES IS SO SO SO BEST . I won a Red-Black Stunner. Actually i like my bike very much and i am in love with it's pick up,looks and performance. the only -ve thing about this bike is that it vibrates after 65 kmph speed. But though i drive within 50 kmph in city so its fantastic. Actually mileage depends on ur riding style. My bike sometimes show 48 km pl mileage and sometimes it show 62 kmpl mileage. if u ll ride at 50-60 kmph then it will definitely show a mileage above 55. To get things clear, there are many changes in the new CBF Stunner (2011 or 2012 version). The bike has a very low mileage of abour 45 kmpl, and it vibrates insanely after crossing a speed of 50 kmph, or revving the engine more than 5000 RPM. On the other hand, the older model of the CBF is a gem. Softer, smoother, and very much fuel efficient, provides upto 65 kmpl. If you want to buy a Stunner, it's too late. Now all the bike is left with, is the looks. I suggest you not to go for it.